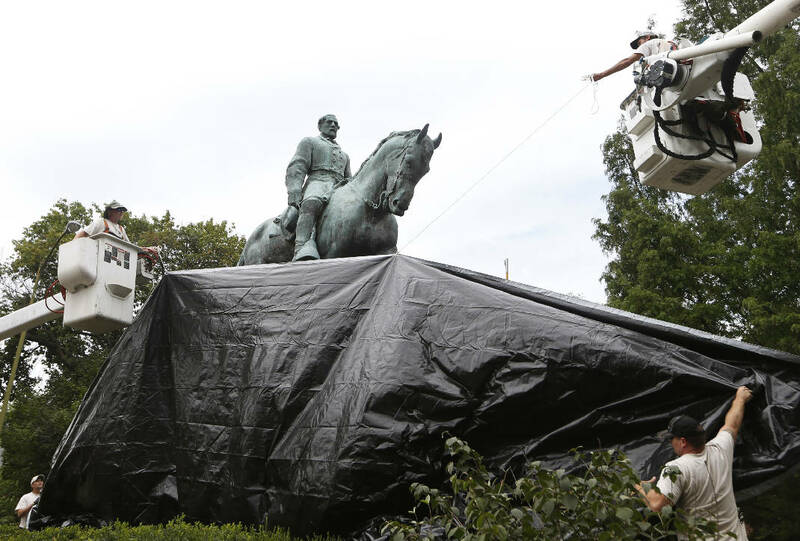 CHARLOTTESVILLE, Va. (AP) — Workers in Charlottesville draped giant black covers over two statues of Confederate generals on Wednesday to symbolize the city's mourning for a woman killed while protesting a white nationalist rally. "It's great. It's a good start," said Jamie Dyer, who spoke a short time later from nearby Justice Park, where workers covered a statue of Gen. Thomas "Stonewall" Jackson. "They do have to go, but it is a start, and I'm glad the city has finally recognized it has to happen on some level." The city council voted to shroud the statues early Tuesday, at the end of a hourslong meeting packed with irate residents who screamed and cursed at councilors over the city's response to the Aug. 12 rally. The event, dubbed "Unite the Right," is believed to be the largest gathering of white nationalists in a decade. The man who police say was driving, James Alex Fields Jr., has been charged in Heyer's death. The death toll for the day climbed to three when a helicopter that had been monitoring the event and assisting with the governor's motorcade crashed, killing two state troopers. The rally was sparked by the city council's vote earlier this year to take down the Lee statue. That decision is in the midst of a legal challenge, and a judge has issued an injunction preventing the city from removing the statue while the lawsuit plays out. In other developments Wednesday, Christopher Cantwell, a white nationalist from New Hampshire, was expected to turn himself in on three felony charges. Contacted by The Associated Press, Cantwell acknowledged he had pepper-sprayed a counter-demonstrator during an Aug. 11 protest on the campus of the University of Virginia. But he insisted he was defending himself, saying he did it "because my only other option was knocking out his teeth.